Spent most of the day yesterday with our friends Doug and Nancy and his brother Dwayne and wife Agnes. Another one of our seasonal campers left yesterday, and then another couple of campers showed up towards the end of the day. You can sure tell that everybody is back at work and school! We went for a walk around the park in the morning and out both of the cabin roads to have a look at some of the properties. These two "cabins" are pretty fancy! There are around 80 cabins on the park property. Some of them really are cabins and would sell for about $80k, others are full size houses worth upwards of $400k! Funny thing, is that you don't even own the property, only the house that is on the property. The cabin owners pay an annual lease fee to the park. Many of the cabin owners have pulled in their docks for the season. We've been having a real stretch of great weather. Sunny and 28C (82F) yesterday, and they're calling for 29C (84F) today which is close to a record high for this area at this time of year. Still, even with the great weather the campground is pretty much empty. Supposed to cool off to the seasonal highs of around 21C (70F) but still sunny this weekend, so we'll see if that brings any late season campers out. Had a great happy hour with our friends and then we each made a dinner meal and shared it at the picnic table. Dwayne, Agnes, Kevin, Ruth, Nancy. This is from their camera with Doug taking the photo. Doug and Nancy still had a bottle of our favourite tequila and brought it along with them! We had a toast! 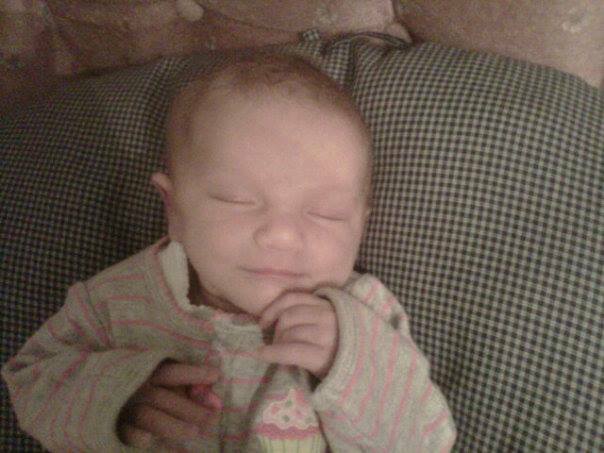 Lindsey sent us a camera phone pic of our 6 day old granddaughter Sadie! Sleeping peacefully! It's nice seeing you together. We can hear the laughter from here! That is a sweet picture of Sadie. I wouldn't be surprised, Paula and Jerry there sure was lots of it. We had a great time, it was just what we needed to help tide us over until we are finished up here for the season. Thank you Paul and Marti, we can't wait to meet her in person. I wouldn't blame her if she did bop us over the head. I never even noticed that in the picture and for the life of me I can't figure out what it is that she is eating, we didn't have anything at the table that looked like that. Sure hope she doesn't end up hating us for it, lol! Sadie is precious - love her little smile! That was so nice that your visitors shared their Happy Hour stash with you. Like they say "and a good time was had by all!" Lindsey calls that smile a sleep smile and apparently she does this a lot, I guess she is a pretty happy little baby. I would love to be with you all together and have fun like we used to have at HC in Mexico. Please say greetings to Doug and Nancy. Your Sadie is such a cute little girl. Wish you would have been able to join us too, Renate! Ruth, you look fantastic! The baby looks very happy, almost smiling! She must have been dreaming about something. That is a precious little photo of your Sadie. Lovely photos of special times with your friends. You all look like you don't have a care in the world! Thank you Sft, she is a precious little thing for sure. At that point in time we didn't have a care in the world, we all just wanted to enjoy each other's company and live in the moment. Oh i meant to say I posted my blog past for the CAPTURE THE COLOUR COMPETITION today. I took AGES choosing the photos. Good luck with the competition, your photos look great, love the one looking down on the elephants from the airplane. Sadie looks to have reddish hair??? So glad you cab finally let your hair down and just relax. Enjoy the beauty of nature. I don't think so Contessa, Lindsey said it looks like the colour hers was in the pictures of when she was a baby so that would have been a sort of browny kind of colour, even though she ended up being blonde by the time she was a year old. Yes, it has been nice to be able to relax just a little bit. Hoping to get out in the canoe again before we leave. We can't thank you, Kevin and Ruth, enough for the fun! Like always, you made us feel so welcome and it was SO good to see you guys. Travel safe through this fine world and we look forward to seeing you, somewhere in Mexico! We are so glad that you came to visit and also Dwayne and Agnes, it was so fun to get together with all of you and just relax and enjoy ourselves. Take care on your drive back home and enjoy visiting your relatives along the way. We look forward to seeing you both again in the future too.